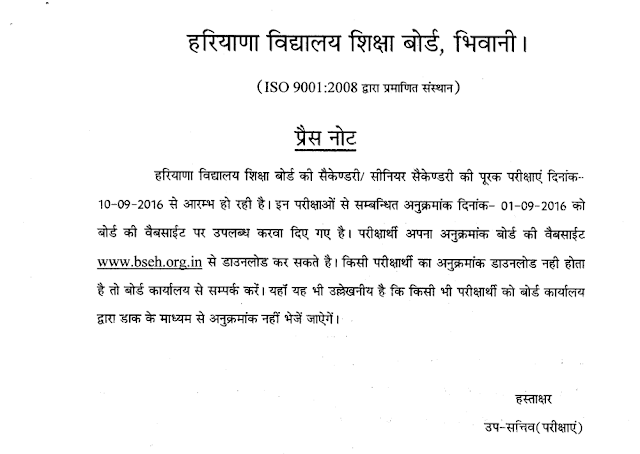 Board of School Education Haryana at Bhiwani has been issued the Admit Cards for September 2016 exam.Now candidates can download their admit cards by entering their last exam admit cards roll no.This admit card is compulsory for appear in th September 2016 re-appear exam.The examinations for re-appear and improvement will be start from 10.09.2016.Date sheet is already available on hbse official website www.bseh.org.in.The starting date of examination is 10.09.2016 and the last date of examination is 28.09.16.It is notable that HBSE announced the Senior Secondary result on 18.05.2016 and Secondary result on 22.05.2016.Due to Partial Achievement-Reappear and Reappear a large of students are going to appear in September 2016 exam. 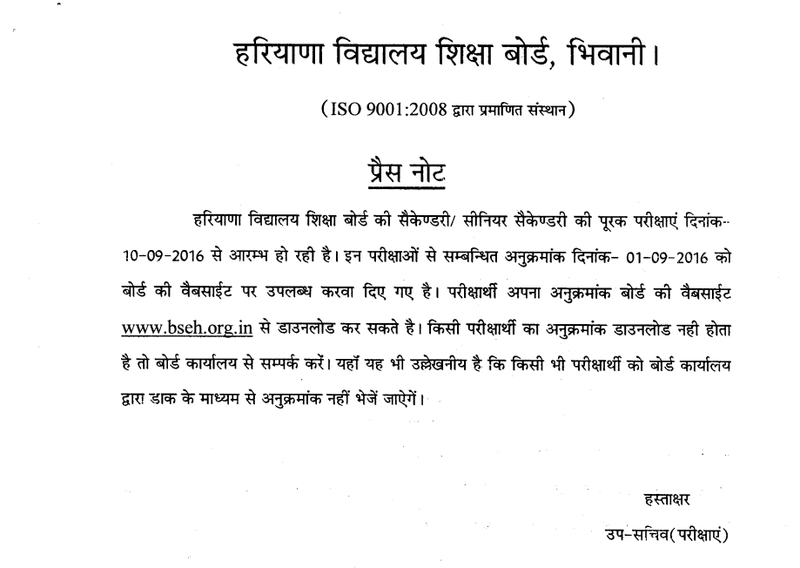 10-09-2016 -Hindi,14-09-2016-English,16-09-2016-Physical & Health Education,19-09-2016-Mathematics,21-09-2016 -Social Science,24-09-2016-Science and 27.09.16-Remaining elective subjects. 13-09-2016 -Hindi,15-09-2016-English,17-09-2016-Physical & Health Education,20-09-2016-Mathematics,22-09-2016 -Social Science,26-09-2016-Science and 28.09.16-Remaining elective subjects.